AirportWatch | Blog on Nantes: How far is the government entitled to go in enforcing the building of a new airport? Blog on Nantes: How far is the government entitled to go in enforcing the building of a new airport? This is a personal blog on the subject of the proposed building of a new airport at Nantes, and gives both some background of the opposition and a personal account of being subject to tear gas. Apparently the sequence of events was as follows: some demonstrators tried to climb into the grounds of the Prefecture in Nantes The police then used the water cannon on them. Stones were then thrown at the water cannon operator. The police then let off a tear gas grenade. He says “If any structure can only be built by the state enforcing its will by violence on protesters, should it be built at all? And when that structure is as pointless as an airport for millions as the time of peak oil means air travel must diminish, who is benefiting by its construction? How far is the government entitled to go in enforcing the building of a new airport? This isn’t (yet) a question about Heathrow. Nantes Atlantique Airport (NTE), or Aéroport Nantes Atlantique, is the largest airport in the west of France. It was originally a military airfield before WWII, and was called Aéroport Château Bougon – the nearest city is Nantes, five miles away, and the airport itself is in Bouguenais. The airport’s official capacity is three million passengers a year and in 2011 saw 3,246,226 passengers. Cheap air travel and millions of air passengers per year cannot continue for much longer. Oil is a finite resource, and it takes a lot of crude oil to produce jet fuel for modern planes. Building big new airports on the presumption that the numbers for travel by air will go on and on increasing is a short-sighted folly. 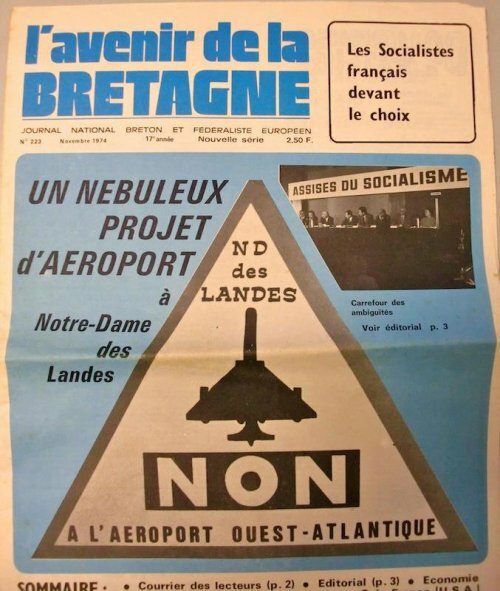 Since the 1970s, from about when Concorde first flew, the idea of a new airport for Nantes has been under discussion. The idea is that air travel will continue to increase, and western France must expand airfield capacity to meet the expected demand if oil were an infinite resource: four million passengers a year by 2017 and nine million by 2050. Ibrahim Nashawi and colleagues at Kuwait University’s College of Engineering and Petroleum published a study in 2010 which predicts conventional oil production will peak in 2014. There are a lot of stories about having a bad time in airports. There’s a special subset of bad time if you happen to come to the attention of airport security. (And there are some prevalent myths, too.) Douglas Adams famously noted that there is no such expression in the English language “as pretty as an airport”. But if you want to know what happens when a region builds an airport on the assumption that air travel will just grow and grow and grow, check out Montreal-Mirabel International Airport sometime. It opened in 1975, North America’s largest airport, and closed in 1997, though its runways still carry cargo flights, medical evacuation flights, and sometimes private aircraft with no more than fifteen passengers. Don’t you just love those stories about the future of travel? You know, the ones where we’ll be able to fly around the world in an hour, or that all high-speed trains will be fuelled by a spoonful of Vegemite in 10 years time. Other than the fact that none of them ever come true, they’re great, aren’t they? One story that caught my eye last week was the proposed floating airport in London, featuring four runways tethered to the seabed in the middle of the Thames estuary. Not only will the airport rotate to deal with changing wind and weather conditions but it also has the ability to expand, with additional runways being attached to the original structure simply and cheaply. Architects Gensler have proposed the new airport as part of a bid to become the builders of any future airport in London and are confident a floating airport would work. Because nothing could possibly go wrong with an airport on a tidal estuary, right? But the question that people should ask whenever business interests declare that a new airport is necessary is: necessary to whom? The plan has opened divisions in the ruling coalition with MPs from the Green party, EELV, promising to join the protesters. Around 10,000 farmers, former residents, ecologists, politicians and local officials are to rally in Notre-Dame-des-Landes to “reoccupy” the 1,700 hectares of agricultural land where the airport is to be built. Hard-left former presidential candidate Jean-Luc Mélenchon was set to join the protesters, as were Green presidential candidate Eva Joly and other members of her EELV party. The greenfield site for Projet d’Aéroport du Grand Ouest was meant to be cleared of trees this summer: a group of protesters moved on to the site and built huts to block the developers. Officially, it’s unlawful to evict someone from their home over the winter in France (from 31st October to 15th March) and the protesters were hoping that they could count on stopping development at least until spring. Europe’s largest postcapitalist protest camp – a kind of rural occupy on the eastern edge of Brittany, half and hour’s drive from the city of Nantes. Like a rebel constellation spread across 4000 acres of forest, farmland and marshes, it takes the form of old squatted farms and fields, DIY strawbale houses, upcycled sheds, theatres and bars cobbled from industrial pallets, hobbit like round houses, cute cabins built with the world’s waste, huts perched frighteningly high in trees and a multitude of other disobedient architectural fantasies. La ZAD has been a laboratory for ways of living despite capitalism since the 2009 French Climate Camp. At the camp activists and locals put together a call for people to come and live on the Zone to protect it. Now you can find illegal goat herds and organic bakeries, bike workshops and bee hives, working farms and communal kitchens, a micro brewery, a mobile library, and even a pirate radio station: Radio Klaxon. Emitting from a secret location somewhere in the Zone, the station hijacks the airwaves of “Radio Vinci Autoroute” the traffic information channel run byVinci for its private network of French motorways. The world’s largest multinational construction firm, builders of nuclear power stations, African uranium mines, oil pipelines, motorways, car parks and the infrastructure of hyper capitalism everywhere, Vinci also happen to be the company commissioned by the French government to cover this landscape in concrete and open Nantes new airport (it already has one) by 2017. Well that’s the plan. more than 40 tractors were chained together to protect a group of huts built by anti-airport demonstrators as they got ready to face new police efforts to clear the site. They have rebuilt huts destroyed by earlier police action and supporters started arriving early today to prepare for a fourth day of direct efforts to dislodge them. Prime Minister Jean Marc Ayrault, the former mayor of Nantes and a strong supporter of the scheme, has called for a six-month break where protests and work clearing the site would be suspended while talks went on to find common ground. However, government spokeswoman Najat Vallaud-Belkacem said there “was no way to overturn the airport project”. Ayrault is likely to get his answer this morning when Acipa, the main organising group of the protest, and other groups combine for a press conference. They say “there can be no talks without police being withdrawn”. On Saturday, 24th, during a peaceful march through Nantes, reportedly an incident injured a policeman and the police then turned tear gas and water cannons on the march, though it was in the city centre and near a main tram stop. The police then started spraying the crowd with water cannon. At this, the crowd, some thousands strong in the gathering dusk, gave a very angry roar. It is a sound I have heard before only in the context of a football match. It is the sound you hear when the home striker, through on goal, with the ball at his feet, is hacked down by a desperate defender on the edge of the box. This is not a sound that any politician wishes to hear at the gates of the palace. Whether the CS gas was mixed into the water cannon, or grenades were launched separately I do not know–we, toddler in hand, were already on our way home at the first sign of trouble. Nonetheless an unpleasant burning sensation pursued us home up the quay. I don’t know what the regular folks standing at the tramstop made of all this: we were particularly sorry for a mother with a baby in a pushchair and a toddler walking alongside who could not leave the area quickly. Doubtless a thousand such stories were told last night. Does the French government really intend to gas its way to building this damned airport, whose construction flies in the face of all reason? Shame on them! If any structure can only be built by the state enforcing its will by violence on protesters, should it be built at all? And when that structure is as pointless as an airport for millions as the time of peak oil means air travel must diminish, who is benefiting by its construction? Posted: Thursday, November 29th, 2012. Filed in News about Airports, Recent News.